So Easter is at my house this year - I am so excited. I plan to set the table with my grandmothers china and do the above centerpiece but use the TyeDyed Eggs in the middle. 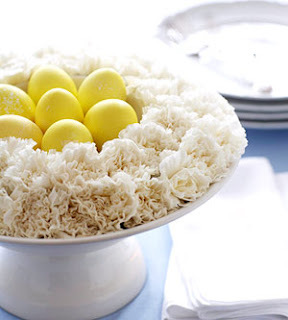 Turn a handful of dyed eggs and a bouquet of carnations into a playful spring centerpiece. Fill a medium-size footed bowl with a few inches of water. Nestle dyed eggs in a smaller bowl (prop bowl on a dish if necessary). Cut carnation stems about 2 or 3 inches long and pack the blooms around the bowl of eggs.